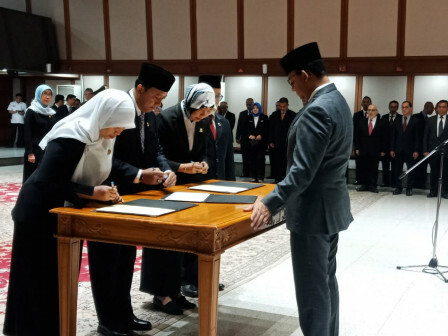 Jakarta Governor, Anies Baswedan inaugurated seven echelon-II officials serving under Jakarta Provincial Government, Wednesday (1/9).
" So give a good example of leadership and keep the mandate well"
It was officially witnessed by City Secretary, Saefullah, Jakarta Family Welfare Movement (PKK) Head, Fery Farhati, mayors and regents, Regional Leader Coordinating Forum (Forkopimda) ranks, and several Regional Working Unit (SKPD) leaders. Anies wanted them to give new changes in each agencies. "By so we could realize all development plan s in Jakarta. So give a good example of leadership and keep the mandate well," he expressed, after inauguration process at City Hall.